Hi sweetie this is sooooooooo gorgeous I lurve this image & love the colours & embellishments. Hope you are feeling better shug. Absolutely sensational! Gorgeous image and background! WOW!!! A stunning card Sassy. I LOVE that sweet image and gorgeous colours with your wonderful Sassy embellishments too. The sentiment is so special. Beautiful card Sassy, do like this image the colours the ribbon and the pins. Sassy this just so beautiful. Love the soft colours and gorgeous textures. Gorgeous card beautiful detail and design. This is so beautiful Sassy! Love the colourscheme and all the gorgeous details! Adorable Sassy. Can I have some of your energy please. Hubby and I have had the Winter Vomiting Virus and we are both still very weak. 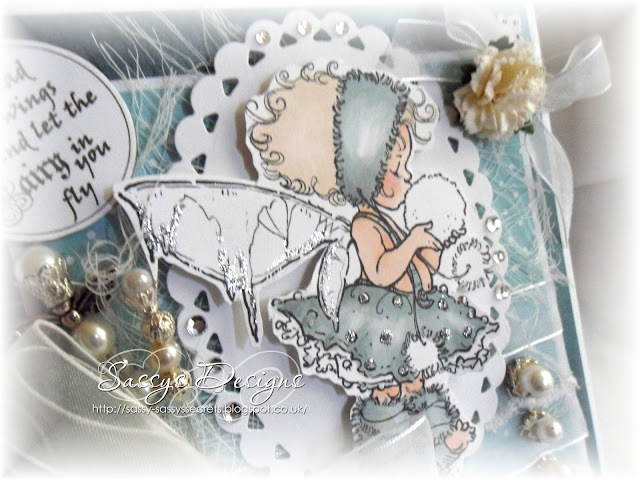 Love the cute image and all the gorgeous layers and embellishments. Wow! Who wouldn't like this, Sassy - it's absolutely stunning with so many precious details. Wishing you a very Merry Christmas, hun and best wishes for the New Year. Im so glad you didnt leave FF!!!! how wonderful this is! love thsi Mo image so much, really very wintery and beautiful!